I follow a few electric vehicle (EV) news websites fairly frequently and came across an interesting story today from California. The US in general is quite far ahead of Canada in infrastructure, but despite the largest EV market in California, they have not had the best infrastructure to-date. 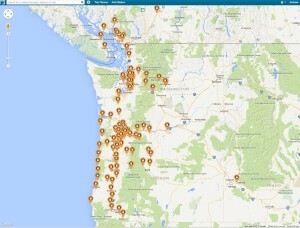 Washington and Oregon have the best, implemented through a number of programs, generally grouped under the “West Coast Electric Highway” – I think they are the best because they have a good network of smartly spaced Level 3 Quick Charger stations, check PlugShare to see what I mean. They have done the best job of following the Tesla Supercharger model [spaced optimally for intra and inter regional travel]. 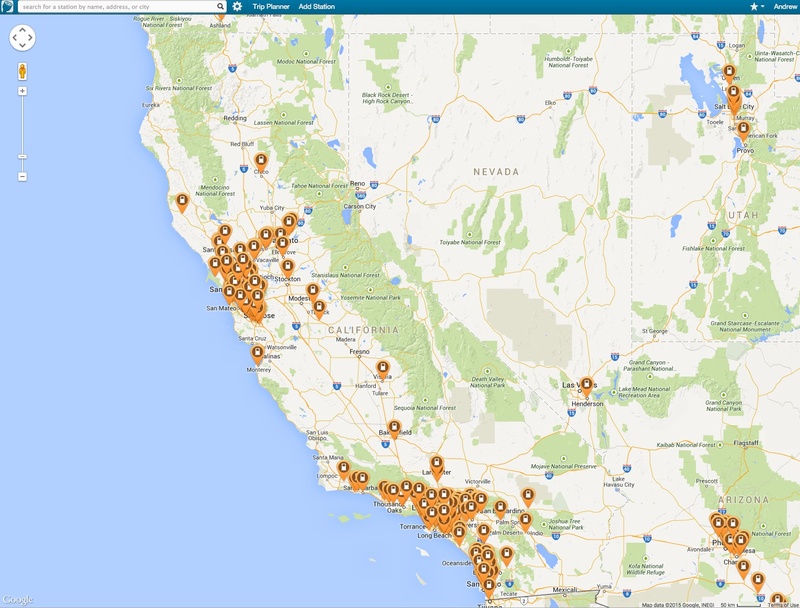 Anyways, Pacific Gas & Electric (PG&E) is planning to roll out 25,000(!) 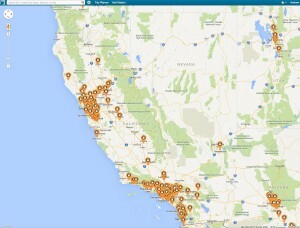 electric car EVSEs in California over the next 5 years (click here to read the story). One hundred of those stations would be the Level 3, direct current quick charger type (DCQC). 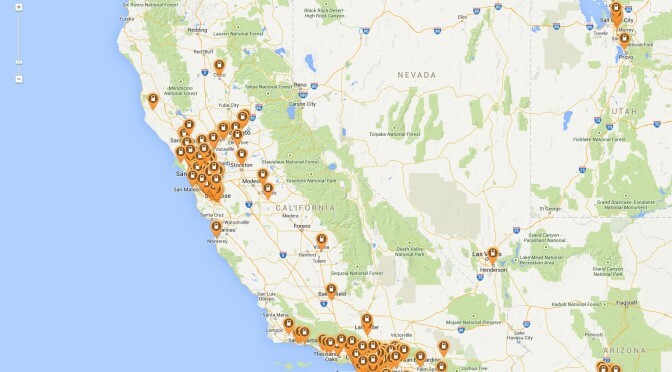 This would quadruple the existing network in Cali and will extend coverage to the currently under-served central and northern portions of the State. Closer to home, BC Hydro has built several DCQC in BC, and has plans for several more, but it would be great to see them (and Fortis) put out a similar full-scale effort (i.e. including Level 2 EVSE deployment). 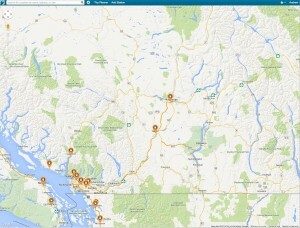 Plugshare’s map of Level 3 chargers in BC. BC Hydro has started to install chargers outside of the lower mainland and I believe is trying to complete a southern interior loop. 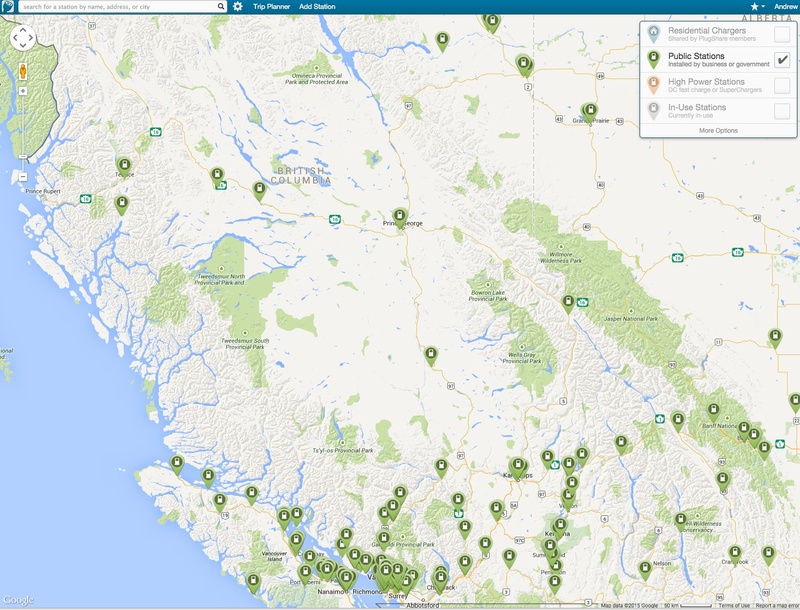 Increasing infrastructure will be the most dramatic way to increase uptake of EVs in BC as it will allow more people to use EVs as their only vehicle, and will also bring access to charging for those who cannot have a home EVSE.